Our Experts Help You Find the Best Ski Boots for Your Feet. 7 Pro Tips From Our Docs on Finding the Perfect Ski Boots for Your Feet. < PREVIOUS Stubbed Your Toe? Science Now Says “Swearing Like a Sailor” Offers Real Pain Relief | article | NEXT >Lumps, Bumps and Cysts of the Foot: Plantar Fibromas, Ganglion Cysts and more, oh my! Ski boots are ski boots; just strap ‘em on! 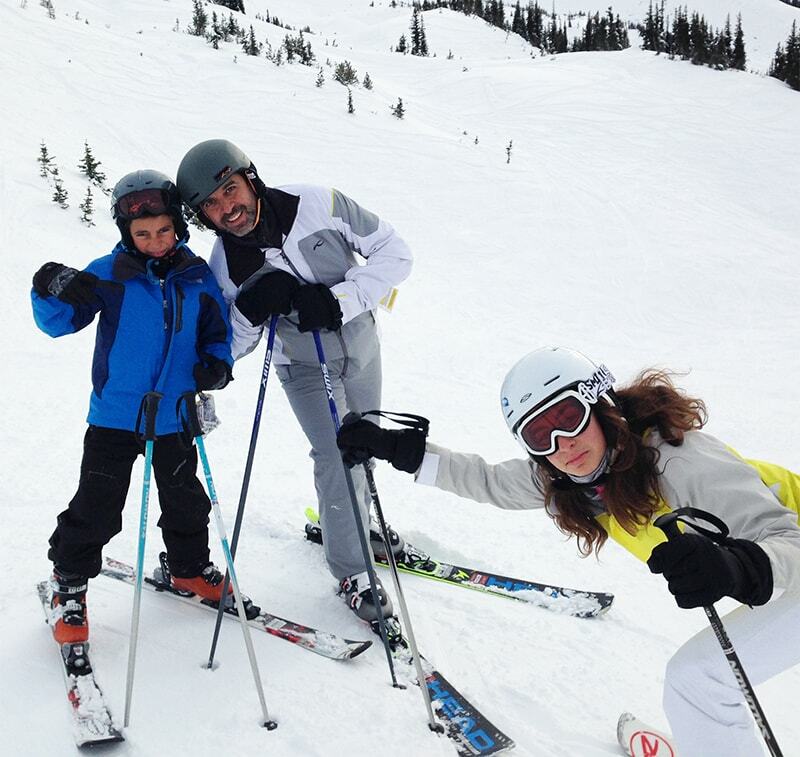 UFAI’s co-director Bob Baravarian and his kids hit the slopes in Colorado. As in all sports, the type and fit of your gear is just as important as its quality. Ski boots are your direct connection with your skis, so it should come as no surprise that the type of boot you ultimately choose will have an enormous impact on your performance. Whether you’re fresh as the driven snow or king of the mountain, finding the right ski boots is no easy feat. Ski boots can vary in every conceivable manner, from the fit to the flex, to the last width and the liner. Here’s a quick primer on how to shop for ski boots. Shop in person for your ski boots. Don’t just browse Amazon for the best deal. Give your feet the respect they deserve and have them fitted by a specialist retailer. Your fitter will have the experience and expertise to help you determine which model is right for you, and ensure that you get the best fit for your foot. Be open and honest about your skiing ability. What your fitter needs from you is an accurate and honest portrayal of your skiing abilities. If you oversell yourself, you’ll wind up with the wrong boots. In the same vein, speak up if something doesn’t feel right. Your fitter needs your feedback to do their job. Know what your skiing goals are. Just because your friend can’t shut up about their favorite brand of ski boots, does not mean it’ll work for you. Boots can and should be tailored to the activity you’re undertaking, as well as the person undertaking it. Knowing your weight, size, and experience level will help your fitter find the right boots for you. Think about your skiing goals. Are you more Alpine or cross-country? Freeride or freestyle? Groomed slopes or off-piste? Determining these factors ahead of time can help you find the boots that will make your ride easier and maximize your performance. Consider customizing your boots with custom insoles. If we haven’t impressed upon you enough the need to individualize your ski boot shopping experience, let us take it one step further. Many boots have liners that can be heated and shaped to fit. This can make your boots more comfortable and ease some of the breaking-in process. Wear Custom Orthotics in your shoes? Wear them in your ski boots! 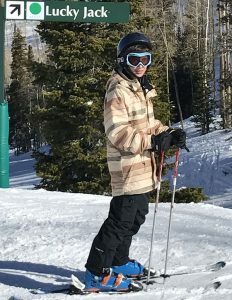 Our website manager’s son Jack tests his luck in Utah. You can also look into custom insoles, also known as “custom orthotics.” You really, really need them if you have flat feet or high arches, but they’re a great choice for anybody serious about skiing. They can add a layer of support to provide more shock absorption, and they can also help to fight fatigue and improve maneuverability. A new and game-changing technology is fully thermo-moldable shells, which can often be customized more quickly than traditional boots. Do research to become familiar with ski boot fitting terms. Many of the doctors and staff at UFAI love to ski, and so do our patients. Pay attention to the fit of your ski boots, and as always, if you have any discomfort or concerns with your feet and ankles, give us a call. We are here to help you have a great time on the slopes. The physicians at University Foot and Ankle Institute have decades of combined experience effectively treating all foot and ankle conditions. If you would like more information or to schedule a consultation, please call (877) 736-6001 or visit us at www.footankleinstitute.com. Next: Lumps, Bumps and Cysts of the Foot: Plantar Fibromas, Ganglion Cysts and more, oh my!